Can make the biggest acts’ live shows tick – but can also rock a live performance like she’s just landed from a flying saucer. Check. Laura Escudé, achieving superhuman levels of music-technological knowhow, can still share what she’s learned with us Earthlings. It’s one thing to talk about tools. It’s quite another to put them into action, to make them withstand the rigors of creative process and idiosyncracy, let alone the torture test of touring. Laura Escudé is as deep in the trenches, on a day-to-day basis, as just about anyone on the planet. The music tech guru has worked with some of the world’s best-known artists, bending technology to their imaginative desires and world-trotting live shows. (Think Herbie Hancock, Bon Iver, and Cirque du Soleil, among others.) 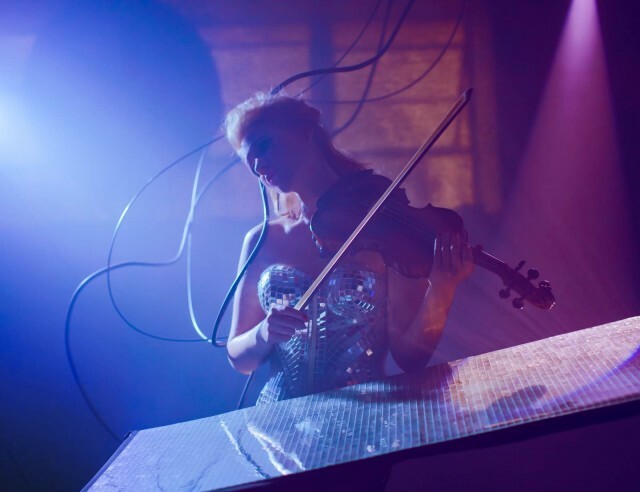 But she’s still found time to develop her own, unique sonic voice and live performance style, working with a violin on one arm and laptop on the other, now under the name Alluxe. And she’s not shy about what she’s discovering. For CDM, we get a chance to talk to Laura about her approach to music and technology alike, and where she sees the direction of live performance heading – her own, but also the rest of us, across the spectrum from big-festival “push play” to experimental soloists. She name-drops a whole array of tools – I’m taking notes, you? – but there are some philosophical messages, too. And what’s unique about Laura is, she doesn’t just bring the perspective of a single soloist or act. She’s worked with artists from very different backgrounds. That gives a reality check to questions of live performance. I look forward to continuing that conversation tomorrow. So you’ve worked with some pretty disparate artists – Bon Iver and Jay-Z are, to me, at least, a bit different in spectrum. How do you change your approach with these different artists, artistically, technically, personally? Is there a common thread in terms of how the technology brings this together? When I go into working with an artist or any sort of live act, I usually have an initial idea of how they might want to build a live show, based on listening to their music and perhaps watching clips of previous live shows. Then, after our first meeting I’ll start to tailor my approach to their current needs. Most of the time they need backing tracks to be arranged in a way that either I or someone else can trigger during the live show. I arrange and edit the tracks, sometimes with ways to loop certain sections for function (Cirque du Soleil) or for improvisation (Niyaz) or add effects to certain parts. Sometimes these sequences change on a daily basis on tour, so it’s important to know the music top to bottom. Backing tracks are the basis for almost every show I’ve worked on, so it’s the first thing I usually design, because without this aspect the songs won’t sound like they do on the record—which is very important to most artists because the fans expect it to be true to the original sound. With the backing tracks, there will usually be a click for the band and time code for video. At this point, most shows are done. Where it starts to get interesting and more creative for me is when extra things are added. For example, in Kanye’s show, I trigger different vocal effects in real time and improvise a bit. This led to working with Bon Iver, which was a lot of fun because I got to attend rehearsals and experiment with different vocal effects for different songs and help them create the desired vocal sound. Then they were having some trouble with their keyboard preset modules, so I converted all of it into Ableton Live and utilized Kapture by Liine so that they could trigger a different song and the tempo, vocal effect presets, and keyboard presets would change. Since I wasn’t going out on the road with them, Kapture made it easy for them to tweak if needed and simply “capture” the state of all of the parameters. In Garbage’s show, I added patch changes for the keyboard and guitar rigs and this information was sent out to these respective worlds for every song, which makes things a bit easier on stage. In Silversun Pickups’ show, I added a bunch of drum samples that change automatically per song, as well as some painstakingly sampled keyboard sounds that became one monstrous Ableton Live Sampler instrument that changed every song. They have the ability to add effects on any of this stuff during the show, as they can be improvisational as a full band. Probably the most interesting show for me to design was Herbie Hancock’s show. This guy continues to blow my mind. I helped him edit “Rockit” and was amazed to find out that the drum beats were programmed by hand—it sounds like a sequencer. Herbie’s show has evolved a lot over the past year; whenever I’m in town, I help to bring it up another level. The initial idea was for him to be able to improvise with various synths and tracks in a way that he hadn’t done before. I got him a Livid OHM RGB and had a custom script made for him that allows the colors on the controller to change depending on what state he is in. He has the ability to loop all different kinds of synths, both hardware (various) and software (Omnisphere) and choose on a foot controller (SoftStep, Pok) which ones he wants to combine at any given time. He can easily change the key of a song when he improvises and this sounds great because we actually put every permutation of the song in the Live set. There is also a second station set up so that he can walk over with his keytar and control the same set from a different location. There is so much to touch on here, but working on his show really gave me the ability to “think outside the box” and go beyond the more “safe” ways to run a show, because of the more improvisational aspect and the use of custom and more obscure controllers. This is definitely one show that never sounds the same night to night. 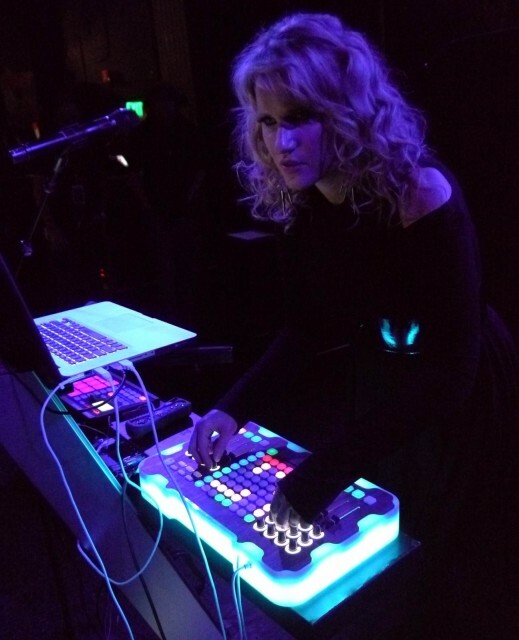 The common thread is using Ableton Live for all of these shows, other than that the controllers and ideas are suited for each individual act. Some people are surprised to find out that I run vocal effects and keyboard and drum stuff through Live, but it’s gotten to a point where the computers are fast enough that this can be achieved and it sounds really good. In some cases, what once took racks of hardware now happens with a few rack spaces or none at all. You’re working on everything from scoring to studio production. How has working with these artists allowed you to create musically? What is your toolset, currently? What kinds of tools are you called upon in these collaborative ventures? Working with these various artists has definitely led to work in the musical realm, which is my first passion. For example, I recorded violin and made string arrangements for the H.A.M. Intro of Kanye’s show from 2011-2012. I played violin on the “Watch The Throne” album on the song “Made in America” with Frank Ocean. I played violin on three songs for Hit Boy’s (producer on “Watch the Throne”) upcoming album. I am producing the music for Yemi A.D.’s first album (Kanye West “Runaway” + show choreographer). Through Bon Iver, I met the up-and-coming band Polica and just completed a remix for “Lay Your Cards Out” that will be released on a comp soon. Through working with M83, I got the opportunity to remix their song “Steve McQueen,” which will be released later this year. Through working with Garbage, I got the opportunity to open for their Los Angeles shows in April. I also recently scored two short films for Visa and have been working in the studio programming and producing for artists. I really thrive with helping others to realize their musical dreams and at the same time, their influence helps me to realize mine. Laura on violin, as Alluxe. All images courtesy the artist. In the past I used many different programs—Pro Tools, Logic, Reason, etc. But given that I specialize in Ableton Live and I happen to love it as both a live performance and production tool, everything I am creating these days happens within Live. Inside Live, I am using all of the latest Native Instruments stuff, I’m really into the newer Reaktor ensembles like Lazerbass [included ensemble in Reaktor 5.7] and Razor [add-on] — I’m really into the Twisted Tools ensembles. I’m using Maschine quite a bit to make beats. I use Omnisphere quite a bit now, I was lucky enough to work with Eric Persing from Spectrasonics on Herbie’s show and picked up a few tips. Rob Papen’s stuff has always been my go-to synths and I have worked with him quite a bit in the past as well. I really like FXpansion’s new DCAM synths and have been using those. I have a million controllers that I use with this stuff that I’ll touch on in a bit! Now, a lot of the time, the tools I use are different people’s expertise. As I get more experienced, I realize that I don’t need to be the best in everything, and I can’t so I should stop trying. I reach out to my trusty network of professionals that also happen to be friends and we collaborate to deliver the most pro project and elevate the project to a cutting-edge level. I have also realized the true meaning of the word “producer” and I have started to bring in different instrumentalists, programmers etc. and guide them through my artistic vision to create something much more interesting than I could have alone. Plus, it’s fun working with other people. Tell us a bit about yourself as a solo artist. How has your live performance evolved? I’ve been gradually refining my live show over the years, and feel like the performance aspect of it has gotten pretty engaging. I definitely feel that if I’m going to perform my own music live, I need to do it in a way that entertains the audience and shows them that I am being improvisational and willing to take some risks. I feel that while the music alone can be very powerful, I am most inspired by bands and artists that grab your attention by their performance techniques and aren’t afraid to look silly, fail or have crazy displays of showmanship. I’ve been inspired by a lot of people around me that have been experimenting with controllerism. In the past year or so, I’ve really tried to upgrade my skills and I think I’ve landed at a pretty unique combination of things. In the past, I played violin through effects, but now I am actually controlling synths using just an electric acoustic violin due to a new program called MIDI Merlin [built in Max/MSP, but available standalone], created by my friend Randy George. I’m actually controlling Native Instruments Razor with it during the show, it’s so cool and it works quite well! I’ve changed up my main controller in the last year as well, now I’m using a customized Livid OHM RGB controller. The design and build was done by Mike Russek and the concept by Henry Strange, who I collaborate with quite a bit and who has many next level projects. The controller has addressable LEDs along the sides of the instrument, and I can control the patterns and colors using MIDI clips in Live. I’m definitely really into the visual aesthetic of live shows, so I like having a bunch of blinky lights on stage. 🙂 I am using the OHM for pretty much everything—playing back clips, effects, volumes, looping violin, changing tempo. I use the crossfader to blend the sound of my violin with the synths I am playing with the violin. I had a custom script made by James Westfall, who helped make different buttons change colors to reflect different Looper states (he also did Herbie’s script) and allow me to navigate in the way that I want to. I also use foot controllers like the SoftStep for turning on different violin effects while playing. Live with the Ohm RGB from Livid Instruments, Laura’s controller of choice. Most recently, I’ve been getting into finger drumming using Native Instruments Maschine. I’ve been inspired by guys like Araabmuzik and Jeremy Ellis and DiViNCi from Sollillaquists of Sound and found an amazing teacher while in Berlin, Boris aka Comfort Fit. I took a few lessons with him and learned so much that I want to practice and incorporate into my upcoming shows. This aspect of performing can truly fail, yet it is very exciting to be playing beats live and perhaps not on a grid at all and even not on top of other sounds! A whole song can be played entirely from a drum controller, and that is something that I never even considered before for myself. The last main piece of gear that I use is the Wii controller, which is great because it’s small, something people are familiar with and a very visual piece. I use it to control [iZotope] Stutter Edit, and it’s great for transitions during a live set. I also use it as something to connect to the audience with. I’ll pass out a few Wii’s and have people mangle sounds or play drums and it’s so entertaining for me to watch people have fun being a part of my show. Sometimes I have to crack down on how often they press buttons because then I can’t hear any of my original music and it messes me up! A look at Alluxe [Laura Escudé] in action with the Wii, in a live performance video from earlier this year. Where would you say your musical voice comes from in the album and the new work? How have your traveling adventures influenced your music? Recently, I have started using a new moniker for a new style of music that I am producing and performing, called Alluxe. The music that I released in the past under my own name was more downtempo and cinematic. I’ve decided that I’d like to try making people move a little bit more and have been crafting some tracks that draw influence from hip hop, trap, bass music, and juke, with a taste of my cinematic flavor. I have released one tune called Shades so far and two mixes, Alluxe Future Forward Mix 1 +2. It’s my intention to expose people to the freshest beats around, and I have spent a lot of time curating these sounds. In addition, I am cultivating my new live performance, as detailed before. I’ve started experimenting with vocal textures and collaborating with some vocalists on this project. I feel that the voice is a key element to any song and it really connects with people on a conscious and subconscious level. I personally have been influenced quite a bit by all of the adventures I’ve had over the past couple of years. I’ve been to more countries than I can remember and have had a chance to connect with other musicians and artists that are doing similar and drastically different things. It is really these connections with other people that keep my music moving forward. I draw from these experiences and feelings to create my sound. It’s been great because wherever I go I always seem to find people that are making music, performing, doing innovative things. We share techniques and collaborate, and I bring these experiences into my own music. In the past month, I’ve been traveling around Europe to different cities and writing music and performing. After Watch the Throne ended, I stayed in London, did a presentation at the Apple Store and performed a show for Soundcrash. In Paris, I played a show and did an online show. In Prague, I worked on writing Yemi A.D.’s album in a beautiful countryside chateau. In Berlin, I have been meeting with various technology developers, refining my live performance, and working on tracks. The world seems to be getting smaller. Every place that I travel to I end up meeting people that are friends of friends, or running into people that I know from different continents and the constant synchronicity of these events is the fuel for my music and source of daily inspiration. We’re talking this weekend about live performance. I suppose it’s risky, in that we can only really answer this for ourselves one performance at a time. But looking to the larger scene, where do you see potential in live performance? Obviously, it’s easy to criticize press-play sets – or, alternatively, defend them for their reliability. But what sort of live performances excite you? Obviously, in working with large shows with thousands of people attending, it can be a pretty scary scenario if something doesn’t work properly. This is the reason why we have redundant systems, to switch over in case something fails. I get the reason why some artists like keeping things safe; a lot is riding on the performance being flawless, and in many of these cases, it’s more about the party than about what the performer is doing. A lot of times, you can’t even see the performer on stage, and it’s more important to dance and express yourself. Plus, a lot of the lighting and video is synced to key points in the music, and although it can be done in a way that respects both needs, it’s difficult to be improvisational. Recently, I went to an album release party for an artist that I was really excited about seeing live. I thought that because she had just produced an album I would get to see these songs performed live, and since she performed vocals on the album maybe she would even sing live. I was very disappointed to find a standard DJ set, with no real interaction with the audience. I might have been the only one disappointed, as the music played was entertaining and provided for a great danceable party—though I couldn’t help but wish she had actually performed her own songs and really connected with the crowd. I think what I’m saying is that there is a time and a place for more improvised performances as there is for more straightforward performances. If I’m checking out Moldover, I would expect some improvisation and variances in music and controllerism. If I’m at Ultra, I am probably going there to dance and party and not be concerned with the DJ’s playing style. The visual aspect of shows is becoming more and more prominent, and I think this is great, because rather than trying to fixate on a person, you get this great entertaining video and lighting that enhances the music and envelopes you in audiovisual pleasure. I’m such a nerd, though; when I see IMAG screens, I want to see close-ups of what the DJ’s or band members’ hands are doing onstage. In the future, I’m really keen on incorporating my own live performance techniques as part of a large-scale live performance—using controllerism in a way that a band member might play a keyboard or a guitar. Plus, these same controllers can control lights and lasers, so it can make it even more fun. I think that although mistakes can be scary for a big show, showmanship through controllerism can also be an incredible way to elevate the sound and visual aspect of any performance and provides an engaging atmosphere in which artists can express their art.